Above ground, the Brody Learning Commons will be separated from the MSE Library by a walkway; the two facilities will connect underground. Picture a place where students could sink into comfy couches, mobile devices in hand, and engage in group study or just read by themselves. Surrounding them would be walls that move and tables where they could spread out and plug in their laptops and iPods. This flexible space would include rooms with drop-down projection screens and high-definition big-screen TVs where students and faculty could view presentations and collaborate with their peers around the world — not in whispers but out loud. Students could access the thousands of e-journals and books in the digital collections and consult the rare and unique print materials that comprise special collections — all of this designed to nurture the research, teaching and learning that are at the core of The Johns Hopkins University's mission. This is the library of the future, and it's coming to the Homewood campus. After four years of planning and study encompassing input from faculty, students and staff, the university's board of trustees on Saturday announced that they are set to forge ahead with plans to construct a complementary library facility adjacent to the existing Milton S. Eisenhower Library. The six-and-a-half-story expansion will be named the Brody Learning Commons for President William R. Brody, who is retiring at the end of February, and his wife, Wendy. The trustees announced the expansion and naming at a farewell dinner for the Brodys on Saturday and presented the couple with a framed artist's rendering of the building, which will be positioned on the south end of the 44-year-old MSEL, overlooking North Charles Street. The learning commons and library will be separated above ground by a walkway and will connect below ground. Pamela P. Flaherty, chair of the board of trustees, said that the naming of the building pays homage to the work the Brodys have done to strengthen our community and reinvigorate student life on the Homewood campus. By greeting entering students and their families each fall, inviting them into their Nichols House home, attending games and other student events, and presiding over the dedication of new programs and facilities, the Brodys have enriched students' academic and social lives, Flaherty said. "When Bill and Wendy announced their plans to leave Johns Hopkins, we were presented with a uniquely appropriate opportunity to honor their legacy of leadership," she said. The design firm for the project has not yet been selected, but university officials hope to complete the project by 2012. "Wendy and I are deeply touched by this great honor," said Brody upon learning of the naming. "One of the absolute highlights of the past 12 years for us has been the chance to live on the Homewood campus and be in touch with the work of the Johns Hopkins faculty and students on a daily basis. Knowing that this new building will encourage better collaboration and new kinds of learning across disciplines, and even across campuses, is especially gratifying to us both. This building will support and enhance a community of learning at Homewood, and Wendy and I will always be tremendously proud that our names are forever associated with Johns Hopkins in this way." The Brody Learning Commons will cost roughly $30 million, all of which is coming from private donations and most of which has already been raised. Winston Tabb, Sheridan Dean of University Libraries and Museums, said that the new building will not be a quiet place like traditional libraries. Rather, it will be a place where faculty, students and staff will be able to talk or even socialize openly — or steal away to quiet enclaves if they prefer. In essence, it will be a place that reflects the social way in which today's students and faculty learn, teach, network and interact, he said. This concept drawing shows an airy, flexible space that responds to students' requests for natural light and multiple learning environments. The expansion will be the first new-construction project on the Homewood campus to pursue LEED certification, as a "green" building. The announcement is the beginning of a process that will engage Homewood students, faculty and staff in the final design of the project. "It's gratifying to know that at last the library expansion will move from dream to reality," said Steven Nichols, chair of the German and Romance Languages and Literatures Department in the Krieger School of Arts and Sciences. "Today's undergraduates were not yet born when folk realized the need for expansion. In the long run, though, we benefited from the wait because today we will be able to incorporate advanced technology that did not exist in the 1970s and '80s." Zachary Epstein-Peterson, a junior classics major and a member of the libraries' student advisory council, said he is excited about the many uses of the planned building. "Given the recent upsurge in library usage by both undergraduates and graduates, as well as the technological nature of modern learning, the new learning commons should adapt to both of these changes, and this is a big part of why we are working on this project," Epstein-Peterson said. "Already we have discussed what we want to see incorporated — namely, natural light, big open rooms, multimedia/technology-based spaces and collections, an expanded cafe, group study space and others. These are just a few of the ideas that have been raised." Alex Drew, a junior public health major, concurred. 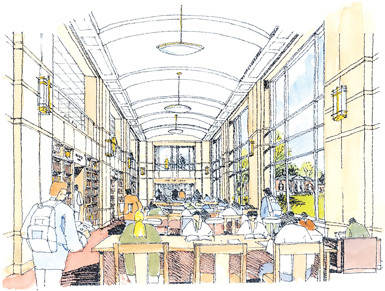 "The library expansion is a long-awaited and needed improvement to the Johns Hopkins community," said Drew, adding that the new space will be an attraction to prospective students. "Spending a majority of my time at the library, I know how much it is used by undergraduate and graduate students daily. With the new state-of-the-art library addition, students [will be able to] find comfortable and quiet study environments that have plenty of natural light," he said. Brenda Hedrick, a graduate student in Italian studies, said she likes the idea of an updated library space. "The library staff has gone to great lengths to determine the needs of students, and to make sure the new building meets those needs," Hedrick said. She added that what is unique about the planned expansion is that university leaders realize that people study in a variety of ways: with others on group projects; in casual discussion with a colleague; quietly, but in the company of others; or in complete solitude. The exact design of the building has yet to be determined, but the concept for it, as well as its purpose, is abundantly clear. The expansion will be a collaborative learning space beyond the classroom and a focal point on campus. The building will be framed by large windows and feature a "librarylike" exterior. It will include space to display artwork and rare books and sculpture. But it is what university officials call the "high-tech, high-touch" feel of the extension that will set it apart from Homewood's existing library, as well as other buildings on campus. To that end, plans call for the design to include such spaces as booths with chalkboard tables; project, video conferencing and interactive media rooms; a 3-D visualization room; a special collections classroom; and performance art space. "The Brody Learning Commons provides an opportunity to build much-needed, imaginative new space to foster learning and advance the academic excellence for which the university is renowned," Tabb said. "With its premiere print and digital collections, the Eisenhower Library is well-established as an intellectual nexus on campus. The Brody Learning Commons will offer a new library environment, transformed by new technologies and comfortable spaces that support the flexible, collaborative learning experiences needed by students and faculty in the 21st century. 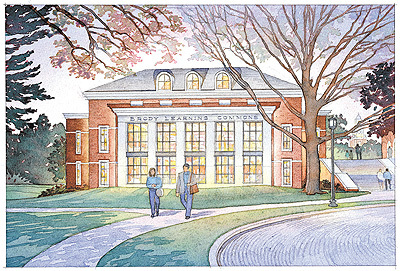 "My vision for the new library building is that it will enable the Sheridan Libraries to provide the best library and information services at any university in America — the kind of library our faculty and students want and deserve," Tabb said. "We will be even more fully embedded than we are now at the center of the intellectual, social and cultural life of the Johns Hopkins community. We will have flexible space that positions us to contribute fully to the research, teaching and learning that are the university's core mission." The new structure will augment the existing library, a 185,000-square-foot facility built in 1964 and partially renovated in 1998 that will for the most part not change. University officials said they proposed the facility, which is on the Homewood master plan that was completed in 2000, largely because the existing library is overcrowded and does not provide enough space for students and faculty to collaborate. In addition, officials said that Johns Hopkins students have expressed a strong desire for light-filled and flexible spaces that cater to their diverse styles of learning. Officials added that other universities have moved toward developing common learning spaces and to be competitive, the university needs to show prospective students that Johns Hopkins can offer the space and technology they need to succeed in today's rigorous academic environments.